It’s hard to know what diet is really right for you in the midst of so much information. But there is a better way of eating that can lower inflammation and fight disease. 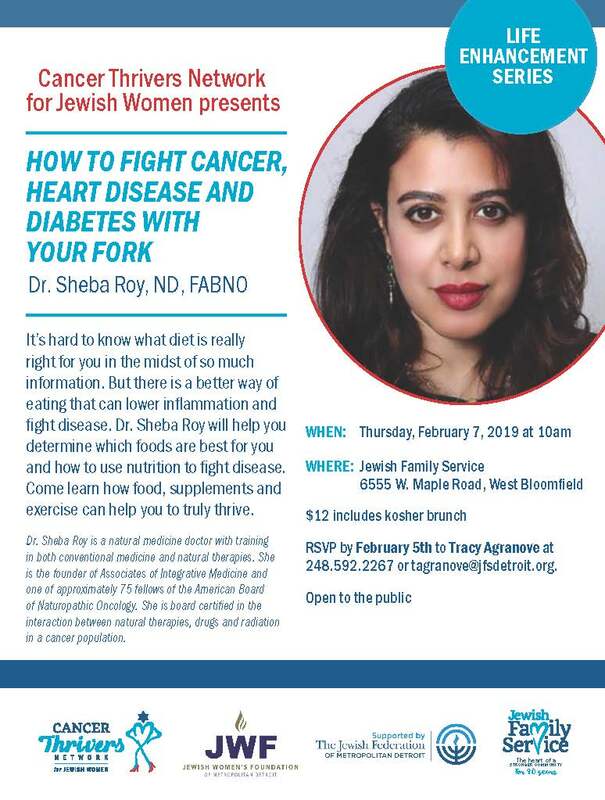 The Cancer Thrivers Network for Jewish Women invite you to join them for an enlightening presentation with Dr. Sheba Roy. Dr. Roy will help you determine which foods are best for you and how to use nutrition to fight disease. Come learn how food, supplements and exercise can help you to truly thrive. Dr. Sheba Roy is a natural medicine doctor with training in both conventional medicine and natural therapies. She is the founder of Associates of Integrative Medicine and one of approximately 75 fellows of the American Board of Naturopathic Oncology. She is board certified in the interaction between natural therapies, drugs and radiation in a cancer population.